Idiyappam (String Hoppers)is a specialty main course breakfast dish for Tamil Nadu and Kerala. Idiyappam is also called as sevai, noolappam or noolputtu. Idiyappam can be served with Coconut Milk, Vegetable Kurma or Coconut Milk Stew. 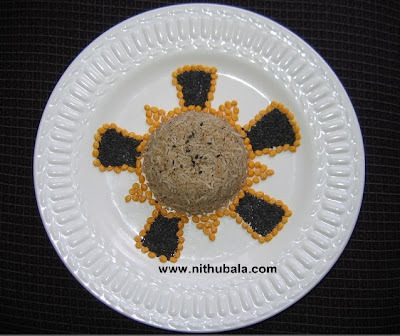 Idiyappam can also be flavoured with coconut, lemon, sesame etc.Idiyappam, in general is made out of rice flour but it can also be prepared in a healthy way with Ragi flour. Ellu or Sesame or Gingelly is rich in Calcium, Magnesium, Iron, Zinc and dietary fiber. The Sesame has a very unique substances called Sesamin and Sesamolin. These two help in reducing the cholesterol level. 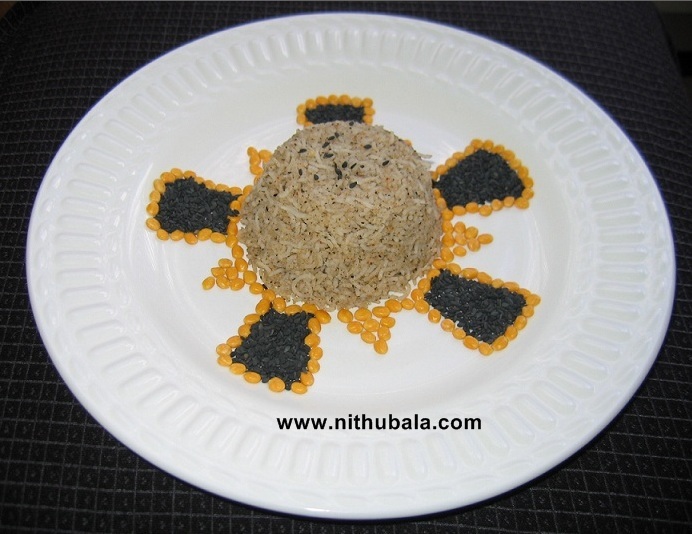 Ellu Idiyappam is a delicious and healthy dish. To prepare Ellu idiyappam, first you have to prepare Ellu Podi (Sesame Spice Mix). Once you prepare the podi, you can easily mix it with idiyappam. Podi can also be enjoyed with rice. Ellu podi can also be prepared in large quantity and stored in air-tight container. Dry roast all the above ingredients except salt. Dry grind with needed amount of salt. Keep aside. 1. Broken Idiyappam - 2 Cups (Frozen or Fresh). Click here for cooking procedure. 2. If needed seasonw with mustard, urad dhal and curry leaves. Do sneak a peek in my space when time permits. Looks delish! My mom used to make ellu podi sevai with jaggery! savory one must be yummier! very innovative and new recipe. New template looks fabulous...Wonderful looking Idiyappam and ellu podi ..
New look of the blog looks good. Nice recipe. Looks tempting and nice photo. nice recipe and fab pics. very interesting. unique dish. will def try.. looks delicious.